Highs at 79, partly cloudy skies. Weather Forecast -- Jan. 12 -- 10 a.m. 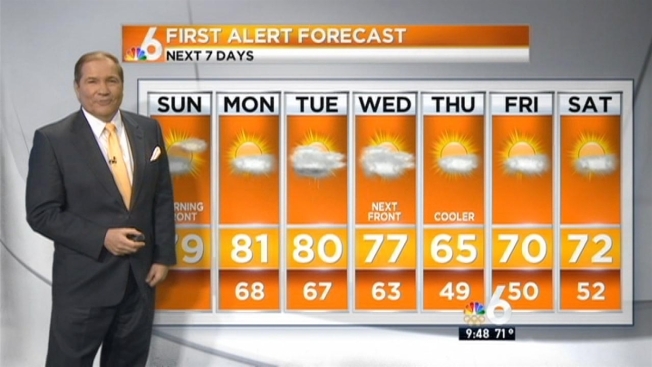 Conditions will be warm with partly cloudy skies Sunday in South Florida. Highs will be at 79, with less humidity and some breeze. There will be a low chance of rip currents for beachgoers and a light chop on the bay for boaters. Temperatures will remain warm through the beginning of the work week. Expect isolated showers Tuesday before the next cold front moves in Wednesday. By Thursday, highs will be at 65 with lows at 49. Cooler weather will stay in the forecast through next Saturday.